Through our Paris office, AJC is actively engaging political, civil society, cultural, and religious leaders to grapple with the rise of Islamist radicalism, as well as the extreme right-wing reaction it has triggered in France and several other European countries. We identify and empower moderate voices in French government and civil society, and we partner with like-minded groups to combat the growing populist forces that threaten the social fabric of France and other democracies. Through research, conferences, digital media campaigns, and diplomacy, AJC aspires to increase awareness within French society and among its leaders about the need to fight Islamist terrorism and to reject extremism in all its forms. 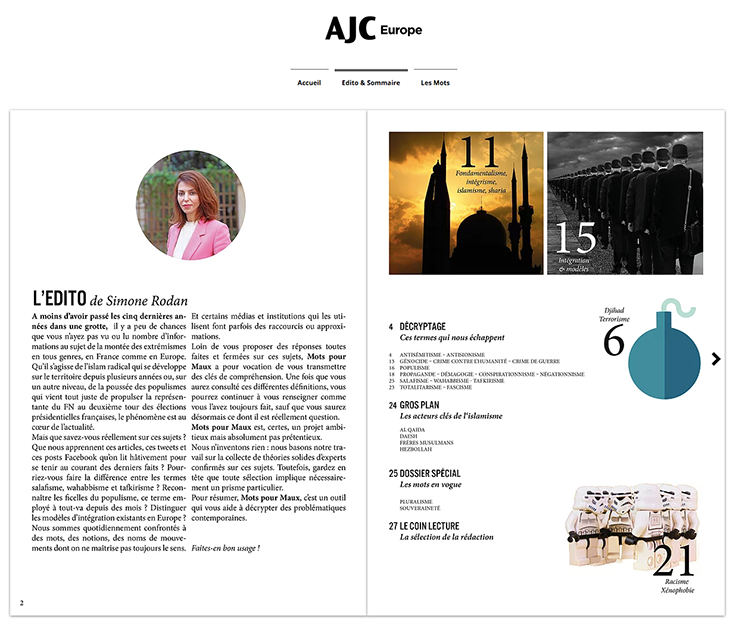 In 2017, AJC Paris launched an interactive e-magazine that defines and explains relevant concepts needed to fight extremism.